Keep it clean. Play nice. Anybody got any information about how the Polywell fusion work is going? An earthquake with a preliminary magnitude of 7.4 has hit near the city of Christchurch, New Zealand, according to the U.S. Geological Survey. Is this about Birkeland’ s currents? (as for the ropes above). Mods, how about a thread on Dr Roy Spencer’s new paper finally published in the JGR? Unless there already was one and I missed it? I’m sure we’ll all be good little kiddies and won’t muck up the sandbox in your absence. In a previous thread we commended on the virtues of France for producing about 80% of their electricity needs from nuclear energy. “If Rajendra Pachauri goes, who on Earth would want to be IPCC chair? Forgot to say, my comments are via Benny Peiser’s CCNet. Two thousand years ago most people were of average intelligence. Now a days, 2010, most people are still of average intelligence. I am now a professional climatologist. Ahhh, an open thread. Having just gotten zambonied over at Climate Audit on a different subject, I’ll try this one in friendlier waters. Ah, of course. Why not. Causes everything else, doesn’t it? “A distinct decline in horseshoe crab numbers has occurred that parallels climate change associated with the end of the last Ice Age…” (emphasis mine). Whew, had me going there, feeling even guiltier about living a modern lifestyle. Glad I read on. But now what’s the culprit? AGW! Where’s that grant application form? Survived millions of years, but now being destroyed by a degree or so. A well-known climate change skeptic has changed his mind regarding the importance of global warming, and in his new book, he is urging the spending of over $100 billion annually to help fight warming. for estimations of ice cap melting and therefore also for predictions of sea levels. Maybe a thread at WUWT?! Nature Geoscience study: melting of ice caps twice as slow as previously thought! Glacial isostatic adjustment has been very imprecise and underestimated in the past. Mass losses in Greenland, Alaska/ Yukon and West Antarctica need sigificant revision. Melting is occurring twice as slow as thought. Well I think it would be a hard sell to blame climate change for whatever horseshoe crabs are doing. Aren’t those critters best part of a billion years old or so, so if there has been climate change I would guess they have seen it. Well perhaps they are only 250 megyrs old; so thay haven’t seen quite as much climate change. I project that HS crabs will outlast humans. A meeting of people to receive spiritualistic messages. Did you mean to misspell it? Now, here’s a good idea! Myron, It was either that or ScienceDoily. JAE, maybe they should just bypass the middle man and hook those things up to the shock therapy electrodes. I posted that I knew what the P in Jeff P stood for & my Comment was erased..The P was for Profesionalism..GEEEZZZ….23 degrees at 76 north on the Healy Cam is the Lowest temp I have seen yet. My Sept 6th date for the Melt to a trickle Stands…Does the Freedom of Posts exist here?..we will see…. Tonyb and I found some persuasive patterns from investigations we started some time ago. It was something I learned a lot from and although we’ve both moved on we thought it was worth turning into a blog post. [reply] Now posted as a new thread – thanks. John, I enjoyed your links and commentary on the decline in the horseshoe crab population. Hmmm, overfishing vs. global warming…. once again the CAGWers miss the target! JAE, I remember a TV show in which a bike-generator was hooked up to 5 100-watt light bulbs. Most of those who tested it could light up only 2 or 3, tops, and that for only a short time. That is interesting news, the electricity from the new wind turbines (based on 2007 electricity consumption) will add exactly 3000/447,233,000 = .00007% to the French annual power needs. I hope they aren’t planning on decommissioning any nuclear reactors any time soon. In all honesty and deference to Anthony’s instructions to “play nice” I am honestly asking you if your point was it to illustrate the “commendability” of this shift to wind power? If so, I don’t see it. Please be nice to me if I have my figures mixed up. Tim Huck, Lomborg’s no dummy. In addition to the $100 billion carrot for the alarmists, his global carbon tax would raise $150 billion a year for third-world health care, clean water, etc, all projects long dear to his heart. (1) Change the carbon tax to a “hypocrisy tax”, e.g. on those who preach small carbon footprint while themselves living large (“offsets” don’t count). From one fish to another..Vigilantfish…the horseshoe crab has survived all kinds of Mother Nature type of Global warmings over the last millions of years or so…I think a tourist or 2 stepping on them will not seal their fate…..Thanks for Posting my last post WUWT..I really dig this site & would love to keep participating even though I’m still just a rocket surgeon….. Being an open thread I would like to bring up how incorrect the saying “go figure” is. The proper saying is “don’t figure” which is a shortened form of “it don’t figure” which is a bastardization of “it doesn’t figure”. “It doesn’t figure” means one cannot figure it out similar to “it doesn’t add up”. So when presented with something that appears to be irrational, unsupported or opposite of intuition one simply says “don’t figure” because one cannot understand how it could be so. It is never a directive to “go” figure it out. Thank You. It am all de rage, as they say. But is it any good? And who are the IAC anyway? Go on, hands up, before they were asked to do this: had anyone heard of them? Thought not: I certainly hadn’t. This is an organisation so well-known that the wikipedia article on [[IAC]] (note: that is today’s version; I assume that someone will add it, eventually) doesn’t even include them, although it has space for 15 or so other IAC’s. Although Gavin seems to quite like the report, I’m less sure. So before getting down to reading the report, here is another piece of meta-analysis: if you read the exec summary it notes that the first IAC report was Inventing a Better Future – A Strategy for Building Worldwide Capacities in Science and Technology. You’ve heard of it? Unlikely – google news shows no hits and all the google hits seem to be to the usual people you’d expect to note it and ignore it. I note that All IAC draft reports undergo an intensive process of peer-review by other international experts though unlike the IPCC it isn’t an open review process – we can’t see the reviewers comments, let alone see the various drafts (and it does need review: there is an error on p iii of the exec summary, where they fail to capitalise Winnacker’s surname. Trivial, obviously). Well unless there is something peculiarly non-linear about intelligence; it would seem more reasonable that about half of the people are of about average intelligence. Or if the range of intelligence from the dumbest of the box of rocks kind of dumbness to the idiot savant level of intelligence; it might be more correct to say that very few people actually have average intelligencve, and that most are actually eith smarter than average or dumber than average. So I would thing most people are NOT of average intelligence although about half of them should be smarter than average. Okay, had the figures wrong. Was comparing capacity to annual output. Actual figure from the turbines is 3000 x 365 x 24 = 26,280,000/447223000 mwh = 5.9% of annual output by 2015, 11.8% by 2020. I think this is a maximum since the capacity is based on continuous optimal wind I would think. Again, if the numbers are wrong, please be nice! The warmth generated by human bodies in the Parisian metro will help heat a public housing project in the city centre, according to the French capital’s largest owner of social housing. “Luckily, the building is connected to the metro through a staircase,” said Francois Wachnick from Paris Habitat. The project should slash carbon dioxide emissions by a third compared to using a boiler room connected to district heating, Mr Wachnick said. Perhaps we should all huddle a little closer in Winter and turn the thermostat down, or, stop breathing. Bjorn Lomborg is a very changeable fellow. He is best known for his book the “Skeptical Environmentalist” – he has now recently changed over to supporting the AGW cause. Most don’t know that before all this he was a AGW promoter – I believe Michael Crichton’s Book Sum of all Fears (?) mentions this. If I am right about this, I think it worth a post. He’s a relatively young man so he has time to change back again. >>Two thousand years ago most people were of average intelligence. Now a days, 2010, >>most people are still of average intelligence. The real issue in the masses understanding climate, is that 50% of the population is below average intelligence ! (Median is very close to mean for intelligence). by a long time friend of John Michel (who died earlier this year)whose idea it originally was. Just another anecdotal horseshoe crab story, but I spend two weeks in July every year for a family get-together (Folly Beach, SC by Charleston) and for the last 35 years we have seen a few crabs washed up on the beach (dead), over the two weeks, This year I saw close to 30 of them. Even found one half-buried (low tide, dryish tidal pool) dug it out, threw it back in the ocean, and it crawled right back onto the beach. They all looked in pretty good shape, all body parts attached. It seemed a little strange to me, but the sea turtles had laid 52 nests by the time we left, and normally that number was closer to 40. Life goes on. Food riots in Mozambique –….Sounds to me like the commodities traders are responsible, rather than mother nature. The following quotes show the grain traders greed and their level of concern for other humans. Remember this is food and without food we die. Again paulw, you show your lack of reading comprehension. Your link states that France builds 3 GW of wind capacity for 10 billion. It does NOT state that France will produce 3GW of power or 3 GWh per hour from that EU mandated project. Because even offshore wind only has a capacity factor (look up what that means) of about 33%, they are building about 1 GW of equivalent conventional capacity for 10 billion Euro. That is one heck of a way to waste money that is only “justified” because they have to comply with EU renewable mandates. You probably also don’t know that the power output of wind turbines changes with the cube of the wind speed. Meaning if the wind speed drops by half, the output drops to only 12.5% of the previous output. You see the power output of all wind generators of Bonneville Power Administrations (Pacific Northwest) wind power portfolio (3011 GW) in blue, and the electricity demand in red. You can also see how the other sources of BPA (hydro and thermal) have to ramp up and down much more steeply to compensate for the vagaries of wind. You can compare that to the operation of a car. If you constantly have to accelerate and brake a car instead of driving at constant speed, your fuel consumption goes way up. A 30mpg car can consume as much as 4 mpg when under full acceleration. Same goes for power stations. All except hydro use more fuel when constantly ramping up and down. And the only power stations (except hydro) that can ramp up and down fast enough are single cycle natural gas plants. They have lousy efficiencies and are therefore expensive to operate (lots of fuel per MW produced), but they ARE fast. And that’s why in Europe the natural gas suppliers LOVE wind energy and invest heavily in it. Tom, I have always thought “Go figger” more or less meant “whoda thunk?” which can a sarcastic comment on the obvious or a legitimate comment on an apparant contradiction. Go figure that the exact same English phrase can have completely opposite meanings. And as far as i can tell all the warmists are now drooling but what Lomborg did is just analyze what we could best do against AGW IF we had 100 bn a year to fight it. Now that’s simply a thought experiment. It doesn’t say that he really considers it the most important problem now. The AGW crowd, vulnerable people as they are, will surely use every straw they can grasp to continue their misguided crusade so IMHO one should never give them one, and taking them seriously for a moment will only give them the feeling of being right, which they are not. So i think Lomborg made a mistake by doing this thought experiment, but it’s his decision. The 100bn a year would come from the 1bn inhabitants of the developed world of course, IOW the working individuals like me would pay about 500 a year… so i wouldn’t be too happy about it. Half of it would immediately disappear in the pockets of Ban Ki-Moon, Rajendra K. Pachauri (Dr.) and the likes… so i’d rather finance military action against the UN if i had the choice. Any estimated date for when the final Surface Stations Project will be published? I would like to purchase several copies when available. And 2000 years ago the human death rate was 100%. And today it STILL is 100%. No progress at all. Life is still a sexually transmitted disease, and invariably fatal. On the other hand, I heard a politician once claim that he will not rest until every single citizen has an above average income. Showing that at least for politicians, intelligence is a limited and precious resource. The more of them there are, the less each one gets. German land-based wind reached 17 or 19% lately. Just as information. a better word, which are factors which affect climate. The reason I want to get this stuff together is to try and illustrate how difficult (impossible!) it would be to model climate. I have approached this as if I was tasked with building ‘The Model’. This model which would be a large set of differential equations describing all aspects of the climate. I imagine that there are many more possible feedback scenarios. There are also a number of tipping points to consider. When water vapour cools it forms clouds and become a reflector. When it cools a bit more it forms rain and drops out of the atmosphere. When water cools below 0C it freezes and all its properties change again. When CO2 drops below some threshold (200ppm?) plant life stops. Everything dies. I would be grateful for any additions. Well I think it would be a hard sell to blame climate change for whatever horseshoe crabs are doing…. The horseshoe crab goes back 425 million years, the cockroach, oldest winged insect, first appears in fossil records 350 million years ago. I always figured schools should do the same. Cut out all the drugs and use treadmills and bikes to harness all that excess energy the kids have from eating all those candy bars and cokes they buy in the vending machines at school. Make the kids healthier and slimmer too. Actually I have a friend who did this many years ago. He hooked up an exercise bike to the TV. If the kids wanted to watch they had to pedal, the kid pedaling got to choose the channel. Saved a lot of squabbling and headaches at his house. Lomborg never disputed AGW, even in “Skeptical Environmentalist”. You invest in wind power. What do you do when there is no wind? You invest in solar power. What do you do in the night, or when it’s cloudy? These are valid points, which have a valid answer. You need to update your electricity transmission infrastructure to accommodate the fluctuations in wind and sun. You need to add in your computer systems the facility to plan what the intake of renewable energy will be, by analyzing the weather reports. This is something they do well in Spain. You can even get real-time view of the contribution of wind farms to the national grid and the percentage of the utilization of the wind farms. KLA, you quote ROBERT BRYCE, who has a tiff against anything renewable. While skimming a magazine in my library called Buildings I found an article I need to share here. All kinds of professions are joining together to set new green (sustainable) building codes. When I see the word sustainable I suspect the UN IPCC science is the basis of the proposals. The responsible organization (IGCC) “enters a comments period in 2010 and is subject to code change proposals and public hearings in 2011 in advance of the publication of the 2012 edition.” It seems we still have time to influence the nature of these regulations, which are listed near the end of this article. I’m so envious – I used to summer on Folly Island as a teenager, and I loved it! I’ve not been back in 30 years but have many fond memories, and some not-so-fond memories of close encounters with nature inside the cottages my parents rented. I remember a few horseshoe crabs, but not the numbers you mention for this year, and certainly not alive. Perhaps the ones you have noticed are mating? However, judging from the information here – http://www.ceoe.udel.edu/horseshoecrab/history/reproduction.html – the season would seem to be wrong. People have been quoting (without references) that CO2 contributes around 0.4% of the greenhouse effect of the planet, so any change (such as doubling) in CO2 would not make a difference. Apparently, this figure is not ‘0.4%’ (who first said that?) but 20%. If you have a comment on this, please substantiate it. I really do not want to hear comments such as rejecting the author for some conspiracy theory. If you do that, I’ll leave this website. Thoughts and prayers are with you, Anthony. We hope all is going well for your family. Putting the anthro- prefix on everything now a days. We even caused a new geological epoch! Take that nature! You pansy. ….The AGW crowd, vulnerable people as they are, will surely use every straw they can grasp to continue their misguided crusade so IMHO one should never give them one, and taking them seriously for a moment will only give them the feeling of being right, which they are not. So i think Lomborg made a mistake by doing this thought experiment, but it’s his decision. I am with you on both accounts. Surprise, surprise, Maurice Strong ” actually was a senior advisor to James Wolfensohn when the latter was head of the World Bank from 1995 to 2005…. Yup, Yup, I really feel warm and fuzzy about these upstanding honorable gentleman handling all that money. Especially Strong who started the whole CAGW, NGO, mainstream Environmental Activism back in 1972 at the UN’s First Earth Summit. Visitors to this board tend to be well informed and there is much discussion about future energy sources: and indeed how technology will develop them. But it seems to me that in particular our green friends do not understand how and why technology developed to meet our needs and why: and therefore what its limitations are. This leads to speculation about how technology might develop and especially about wondrous new sources of power: and indeed why our current ones are supposedly inadequate. Yet technology, economics and wealth are inextricably intertwined which is something which seems to escape most politicians and scientists too. There are many lessons to be learned from history and the development of technology which are frequently ignored by those who should know better. Although I have been extremely busy this year, which is why I have not written an article I promised Tom Fuller, which by now would be out of date so fast does news travel these days. Yet I have been turning over in what I laughingly call my mind whether the readers of this blog might like an essay which tries to draw these threads together: if so then I will do it as best I can having a few days to spare as it were. If people want that and A. Watts is agreeable I will write it. And then you can all have the pleasure of tearing it apart. Good question. Where did you get it from? Aside from asking here or scanning back posts try looking at the resources and reference tabs at the top of the page in the black banner. Happy hunting and do get back to us with the list. Here’s the rough draft of a prospective guest-post that should appeal to all of our resident CO2 fans. It may not meet your usual standards of excellence, but we’re in a slow-news period. (I had originally put this in Tips & Notes, but that thread is quite long now.) What do you think? A second mechanism involves carbon dioxide sensors. Example: When the CO2 concentration in the blood is too low, the CO2 sensors tell the brain that we need to decrease our respiratory rate. The CO2 mechanism is faster-acting than the O2 mechanism. Most of the time, both systems function normally. But when we drive up to a moderately high altitude for a day-hike, it’s a different story. For example, at 5000 feet (1500 meters) the atmospheric pressure is 15% less than at sea level, which translates into 15% less oxygen. The brain gradually becomes aware of a minor O2 shortage. It compensates by automatically increasing the respiratory rate. Problem: Now that we’re breathing more, we’re losing more CO2 than we did at sea level. And our CO2 sensor are not happy about that. They send a message to the brain, telling it to slow down the respiratory rate. The net result is an unstable equilibrium, in which our O2 sensors and CO2 sensors are pulling in opposite directions. At higher altitudes, we may even experience Cheyne-Stokes respiration, in which we alternate between fairly rapid breathing, and short pauses of not breathing at all. If atmospheric CO2 concentrations continue to increase, mountain hiking will become slightly less taxing. In the meantime, we must make do with suboptimal atmospheric CO2 levels. Fortunately, there are ways to compensate for the atmospheric CO2 deficit while we’re hiking at altitude. First, there’s Larry’s Nature Trick. It involves the common bandana, which we wear bandito-style. How does it work? After exhaling, the CO2 concentration between one’s mouth and the bandana is higher than in the surrounding air. Then when we breathe in again, we recycle part of the exhaled CO2, inhaling a larger quantity of CO2 than we would otherwise. Our O2 sensors are happy, as are our CO2 sensors; so we don’t feel the altitude as much. Caveat. Wearing a bandana also helps us to retain more body heat on cool days. In fact, a bandana placed over one’s nose and mouth has a higher warmth-to-weight ratio than wearing any article of ordinary clothing. However on warm days, a bandana’s heat-retention efficiency can be a disadvantage. Fortunately, there’s a breathing technique that accomplishes the same goal as Larry’s Nature Trick, but without the heat-retention effect of wearing a bandana. However it does require considerable practice before it becomes second nature. I could give a detailed description, but that would make it appear to be more difficult than it really is. Gentle Reader, even if you’re a non-hiker, I hope that you have gained a greater appreciation for the multifaceted nature of our friend, Carbon Dioxide. Trail to the summit of Mt Whitney, the highest point in the Lower 48. Photo by Justin Johnsen, from the Wikipedia article. Anyone heard whether any action is being taken to move the Clipper Adventurer off the rock in the Arctic? It am all de rage, as they say. But is it any good? And who are the IAC anyway? Go on, hands up, before they were asked to do this: had anyone heard of them? The InterAcademy Council (IAC) produces reports on scientific, technological, and health issues related to the great global challenges of our time, providing knowledge and advice to national governments and international organizations. The eighteen-member InterAcademy Council Board is composed of presidents of fifteen academies of science and equivalent organizations – representing Argentina, Australia, Brazil, China, France, Germany, India, Indonesia, Japan, South Africa, Turkey, the United Kingdom, and the United States, plus the African Academy of Sciences and the Academy of Sciences for the Developing World (TWAS) – and representatives of the IAP: the global network of scientific academies, the International Council of Academies of Engineering and Technological Sciences (CAETS), and the InterAcademy Medical Panel (IAMP) of medical academies. The IAC Secretariat is hosted by the Royal Netherlands Academy of Arts and Sciences (KNAW) in Amsterdam, The Netherlands. Oh, goody. The author is Gavin Schmidt. He’s Hansen’s Mr Fixit. I think the only thing new here is the Book. This is all about book sales. The ideas expressed are nearly the same as before. Note that by adjusting the phrasing just a bit he expands the group of folks that might spend the money for his book. Hardcover = $90; but for you, only $56.70 at Amazon.com. The paperback will sell for $29.99 at Amazon. Such a deal. The error in the standard global warming models is that they take evaporation as constant which is not the case. Or, in other cases they just move the lapse rate to a higher altitude (see Hansen’s papers) which is not allowable unless the atmosphere is totally opaque to infrared radiation, but when atmosphere totally is opaque then there is no influence from CO2 anymore. I’ll publish soon an article about this. I welcome comments criticizing the theory or ones helping me make the text more understandable. This website might explain the number you are seeking. reading these comments is like listening to the inmates of bedlam. I regularly view the NOAA Doplar Radar composite image of the continental USA. Can anyone explain the semi circular features that seem to cbe entered on large population centers? Just wondereing if this is a “Urban weather effect” of some description. they all seem to grow and fade according to the time of day. Umm, don’t you mean a rocket sturgeon? From your comment I guess you’ve never clicked on climate progress, realclimate, tamino, skeptical science, etc. If you ever do, you will see that those echo chambers are true bedlam. Here, you’re just part of the chorus. Have to repeat this every so often: Those areas witht the most GHGs don’t ever have the highest temperatures. Why is that? Stephen Hawking announced that there is now no mystery to the event we call the Big Bang. He can explain everything. It’s all to do with M-Theory and gravity. As his brain can go to within a billionth of a second of a big bang. Anyone have a clue what M-Theory is? Thanx. Here is an interesting article about some well known companies twisting themselves in P.R. 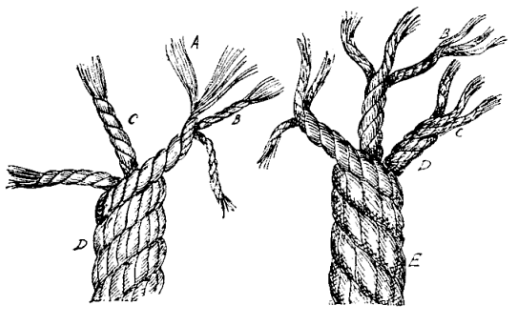 knots over “carbon emissions”. Note to consumers – you know the difference between right and wrong, do what you have to do. Note to investors. There will be a backlash. Don’t go long on these guys (see BP). Note to CEO’s and corporate communication depts. Best practice – don’t talk about it, (it being carbon emissions). There is no upside. The problem is where do any of these figures come from. You stated that it’s more like 20% – so I ask where does that particular statement come from? How do you (or your source) justify that? Likewise, I have not heard the 0.4% either, so who is citing that? Now I am making no statements, whether that be 0.4% or 20% – but you are but without any substance to support them. South Island of NZ rocked by a major earthquake. My sister-in-law’s mother, who lives in Wanaka [5 hours away from epicenter] was awakened by a low rumbling sound and then she felt the shock. What exactly is wrong with tar sands relative to other fuel sources? The places with the highest and lowest temperatures on Earth are barely habitable. The Arctic is just as much a desert as is the Sahara. Ain’t a whole lot moving in either place. Nobody would freak out if the Sahara suddenly got wet and blossomed, would they? But they get all twisted up in a Gordian knot over the Arctic barely warming. These might give you hints of what to search for to answer your particular question. I remember reading of a place in Texas where many thousands of bats came from a large cave each evening and showed up on the radar. If your concern is more common, and near cities, then it is likely and artifact of particulates, dust, or something. Note the term ‘artifacts’ is a useful search term. Well paulw, I think you ought to search the literature and read about this issue for a time and report back. I’ll guess there is an “apples-oranges” issue in your remembrances. I’m not going to guess and try to find out what is bothering you. I’d like to know what you find with respect to the ppm of CO2 in the atmosphere contributed by humans? Also, I’d like to know by what means the ppm of CO2 in the atmosphere will be made to double? Related is how fast and how much can humans increase the ppm to, say, 2X, 3X, 4X from where it now is? Is it possible for humans to double the ppm CO2 in 20 years, 50 years, or what? And the figure for all the wind turbines in Scotland in the first 5 months of 2010 was only 17%. (just over half the claimed load/capacity factor). Wind turbines are fine for remote island communities or off-grid locations, but to try to use them to power a National Grid is engineering and financial madness. Any interest in a Swiss environmental study suggesting a VW Golf has less impact than a hybrid? There was a UK program shown recently in Australia where an entire house is powered by, I think, 250 stationary cyclists generating the entire power requirements. So with base load, like clocks, small lights, fridges etc, I think 50 cycists could generate enough power to operate them. But when things like heaters, kettles, TVs etc came online the number of cycilsts increased. The family who used this for the day were unaware the house was being powered this way. It was an interesting show, but 5 minutes from the end the AGW messages was spat out! Has anyone noticed that the price of food is skyrocketing? First time I’ve ever seen that proton density???? One of the multitude of String theory derivations, involving 10 or 11 dimensions (in dispute ), and very complex math. There is not even agreement on what the “M” stands for – “Membrane”, “Magic”, etc. Google it, if you care to. But it seems to me that in particular our green friends do not understand how and why technology developed to meet our needs and why: and therefore what its limitations are….. Without the basic ability to do “back of the envelope” calculations to determine if an answer was in the ball park, a skill routinely taught when I was in school, we now have a great reliance on computers to do our “thinking.” Unfortunately we then get GIGO as a friend found out when he had a PE design a bridge and screwed up royally. Without these basics, math science and logic, today’s technology has all the characteristics of “MAGIC” to the average greenie. Is it any wonder you get a guy in marketing saying to my friend, an engineer. “If you could just make a solar panel that is four feet by four feet for under $2000 and could power a whole house, I could sell thousands of them” The marketing guy when told why this was not possible, just kept on arguing firmly convinced that the engineers were just not trying hard enough. If someone in the actual business can not understand solar panels are not “MAgIC” how the heck is the average green activist or politician going to react when told the truth? The immediate response is industry is lying. Industry is hiding the patents. Industry is evil. I saw that type of rebuttal for real while working in the polystyrene industry during the “polystyrene is evil campaign” The campaign was a direct attack on my company’s innovate new plant for recycling post consumer polystyrene from McDonalds. The plant was specially designed to use handicapped labor too. Anyone who wants to know the truth of the matter can head for Lemominster MA where the land for the new plant had been purchased and check with city hall and the locals about the plant that almost changed recycling history. I was out and about this morning on the two-lane narrow roads that serve my locale and saw three bicyclists holding up a long line of traffic. Their ‘green’ is not offsetting anything and seems to make things worse. The put the curve of an ironic smile to my mouth. That said, I actually don’t care a whit about the ‘green’ aspects of bicycling. It is a beautiful day for a bike ride in the country and I hope the riders don’t get hit by a car. We’ve had several bicyclists hit over the past few years due to 55mph speed limits on narrow two-lane roads, highly traveled by, undoubtedly, a fair percentage of drivers impaired by alcohol, cell-phone use, or texting. I say, “GO BIKES!”, but I recommend they think about it and go somewhere else a little safer. It’s not so much that the price of food is skyrocketing, it’s that the value of money is plumiting like an upsidedown skyrocket. Climatologists are concerned that if and when the thing hits the ground it will wipe out all gains made todate in eradicating gains they’ve made in educating the retarded public on how to make something out of nothing. What do you think the chances are of a Hav’erd Biz School Grad making it in a World without money? Of course it is to be expected and was done intentionally. It is the result of oil prices, biofuel and new world wide farming regulations that started with the World Trade Organizations Agreement on Agriculture in 1995. It is a complex and lengthy subject. I have over a dozen pages of references. Please ask Tom Vonk go to the next step and address the non-LTE boundary conditions at either the top of the troposphere or at the atmosphere to surface (land and ocean) interface. YET more showers on Thursday, and the dams filling nicely. Who’d have thought? Certainly not the Bureau of Meteorology, which on May 24 warned of dry. We are? Well, that’s a surprise. Because let me remind you of another outfit that assured us the rain was probably gone forever, thanks to wicked global warming. Here is Melbourne Water from last year, explaining why we couldn’t have a cheap dam on, say the fast-flowing Mitchell River, and had to build a $3.5 billion desalination plant instead, at more than twice the price, but for one-third of the water. “Why aren’t we building another dam? Our reservoirs need steady rain over days and weeks, to wet the ground and then generate runoff. …And as the rain falls down, note how your water bills have gone up. Well, that desal plant had to be paid for somehow, right? Even if it will soon be making expensive water that’s now falling free from the sky. I’ve been thinking a little about these large global temperature datasets (i.e. HadCRUT, GISS, etc). My thoughts are with regard to the way they record and average the temperatures for a given period. Let me start with an analogy. I knew a guy who had a van for his business. One day he decided to have it all painted up with his logo, contact info, etc. Now he has people mentioning that they see his vans (plural) all over the place. The reality is, there is only one van. I’ve read that the way anomalies are produced is by taking daily highs and daily lows and averaging them together to produce a daily record that is subsequently averaged into a monthly average, and so on. This method seems to preclude an adjustment for time. I have yet to hear anyone mention any kind of calibration or alignment of this type. While always taking the high and low is definitive in its approach, it almost seems arbitrary, or dare I say it, biased when put in the context of time. I have this image of a huge wave of heat (the sun?) moving around the planet at just the right time to be recorded as the daily high (like the van being seen) while the rest of the planet is cold and dark. I’ve posted before on the question of a ‘4-corner’ temperature average (midnight, noon and the sixes) to capture a better reading of a ‘daily heat content’ metric. My latest thought goes even further to, “What if we were to align the (GHCN?) stations to UTC Zulu, would we be able to attain a better snapshot of the exact temperature (heat content?) of the globe at that exact moment?” Four ‘snapshots’ a day to create the daily average, and the rest is the same moving forward. With the advent of electronic monitoring, this should be pretty simple. The question would always be how to deal with the historical data. Interesting article in the Washington Post titled: Amazon’s Past maybe not so primitive – new findings suggest region sustained advanced civilization, by Juan Forero in San Martin De Samiria, Peru. Archeological findings suggests that the Amazon once sustained millions of people using sophisticated agriculture and water resource engineering. Anyone care to start a string on this? There are two zeros, one lies between the integers of +1 & -1, the other refers to nought (old English for nothing). I believe also that the word zero derives from the Arabic for nothing صفر, ṣafira = “it was empty”. In all practicality, it is not possible to have less than nothing but for mathematics, there has to be negative numbers so that we can write 3-2=1. Convention arranges the negative numbers on the opposite side of the zero. Numbers are used for quantities or to determine quantities, even if abstract i.e. 3x-2x=1x. So what quantity is zero? Is it not an endless nothing, a boundless nothing, or as it was considered in the past, empty? Zero (written as 0) was used before the concept of negative numbers came into usage. Infinity (∞) we accept as meaning a going on for ever, endless, having no boundary. So, using language as meaning rather than characters as concepts, we can see that an endlessness, a boundlessness, is something that we have difficulty imagining but no difficulty in understanding: endless and boundless are words in common usage. But does that mean that zero = infinity? It does if we think of infinity is endless & boundless, as we do for nothingness, although we hit the stumbling block of the concepts of empty and full. If something, as opposed to nothing, goes on for ever, then we could see infinity and zero as opposites. But what is full? If our universe is infinite, it is certainly not full, in fact it is mostly nothing with a slight touch of something we call matter. Looks like the statement zero = infinity is not true, a slight touch of something is something and therefore not empty. But as we are seeking some understanding here, we must ask: what is matter? Well it is best described by E=MC^2 (not yet dis-proven) which explains the physical existence of anything. The theory that a singularity expanded only fits with a description of what happened as far back as we can ascertain and that is based on the observation of an expanding universe. From a singularity – a black hole – no light escapes. The speed of light within that single existence is nothing, stationary, 0. E=M0^2=0. So the infinite space containing everything contains nothing. Zero = infinity Q.E.D. But before the singularity? Before anything? The answer has to be nothing. The general theory of relativity proves that a singularity, by itself is nothing, 0. So the state of nothing can in fact exist. We know this because we can detect a black hole and therefore a singularity, a state which can move on to be everything, a universe, a transition between zero and infinity. A gestation state between nothing and everything – even the concept of negative numbers. Shorter than the Hawking version and may also differ considerably on the concepts! Re the “Green Building Codes”, it may be too late to influence the code impact. I’ve worked on building mechanical systems (air conditioning, heating, insulation) for over 25 years, and there has been little push back against the codes and ungainly regulations being incorporated. The USBGC has beenthe leader inthis effort, and parallels much the same way the IPCC is operated. They claim to be a not-for-profit group, yet are backed by the very same groups that profit from their regulations. The best example of this impact is California. Just to add a 1-1/2 ton air conditoner to an existing data center, I end up filling out 16 pages of paper work. Twenty years ago I would scratch out the specifications on a single 8-1/2×11 sheet of paper, sealing with my professional seal and the design was done. Cost to my client was about four hours of my time. The same job now costs my client over twenty hours of my time, and actually costs more than installation of the equipment. Unfortunately, the Green Code you posted will start the same process nationwide. I am not a scientist but a degreed mechanical engineer licensed to seal projects in 12 states. I don’t post my name because I could potentially lose work if some of my clients knew I was a skeptic. “People have been quoting (without references) that CO2 contributes around 0.4% of the greenhouse effect of the planet, so any change (such as doubling) in CO2 would not make a difference. Apparently, this figure is not ’0.4%’ (who first said that?) but 20%. paulw, i just roughly skimmed through the paper you link to. I didn’t find one occurence for “wavenumber”, “wave number”, “frequency”, “absorption band”, and not one graph. Yes it sounds absurd, but there’s Gavin Schmidt writing about the greenhouse effect of CO2 and being able to avoid all these terms. I’m not sure what he’s doing there; i have the feeling it’s got absolutely nothing to do with physics and a lot with computer models. How about a quick plug for my free Climategate iPhone App? Climategate App contains all the emails, a list of over 180 interesting links (including the famous “Hide the Decline”), and a powerful search engine. The advantage of using an App, rather than the excellent Climategate websites, is that with the App, you dont need an Internet connection – everything is stored on the iPhone. 21 sunspots drawn today. I can project 7 of them. How many can you project? But SWPC/NOAA does not see the little spot at 2N. It appears on SDO AIA 4500 09/03/2010 23:0008 UT image. 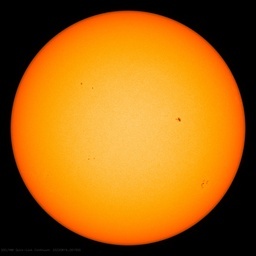 It appears on SDO AIA 4500 09/04/2010 19:0008 UT image. It appears on SOHO MDI Continuum 09/04/2010 12:35UT image. It appears on SOHO MDI Continuum 09/04/2010 09:01UT image. It appears on SOHO MDI Continuum 09/04/2010 05:29UT image. It appears on SOHO MDI Continuum 09/03/2010 21:14UT image. Now, I was under the impression that all the spots were counted, because it was pointed out that SDO and SOHO cannot show more spots than exist, only exquisite detail of the spots, not more of them. You count what you see. It does not matter. There is no selection bias. This story takes a turn. Gavin Schmidt spreads his RC junk science wherever he can — so long as he doesn’t have to defend it in public, lest he get humiliated again. Last time he debated he got spanked hard by the skeptics. 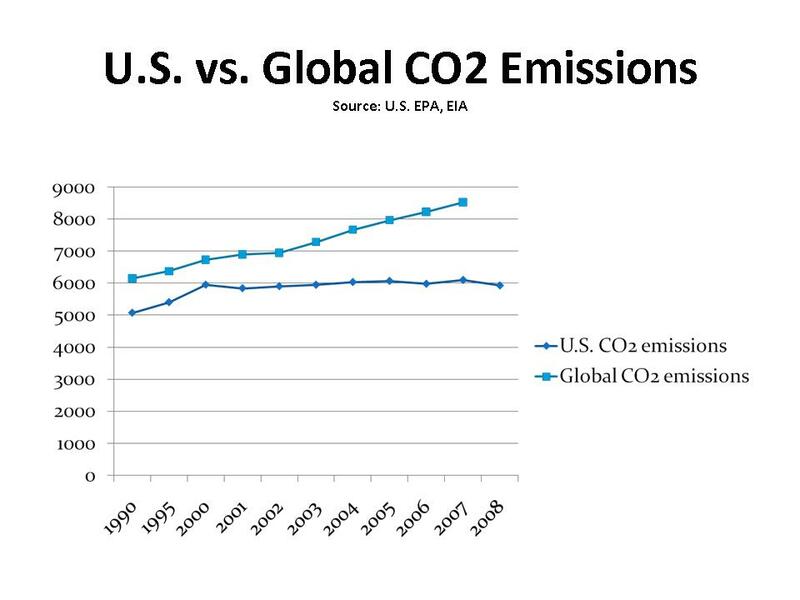 In order to stabilize CO2 you need to reduce global emissions by some 70% and progressively decrease them further over time. The level at which CO2 will stabilize depends how fast that happens. If you do it now, we’d stay at close to 400ppm, wait 10 years, it gets to 450ppm, wait til 2050, maybe 550 ppm, wait until 2100, upwards of 700 ppm etc. (The numbers are roughly right, but don’t quote me!). The longer we wait, the worse the problem gets and the worse the problems will be. So to my mind that implies we should get on with it as fast as is politically, economically and technologically possible. That doesn’t appear to be very fast unfortunately. The consequences of 550ppm (which is close 2x pre-industrial CO2) will likely be very large – some 3 deg C of eventual warming, large shifts in rainfall patterns, significant increases in glacier melting, and large (if uncertain) eventual sea level rise. The last time the planet was that warm was in the Pliocene (some 3 million years ago and with sea levels some 20 meters (!) higher than today. That sounds bad to me. Anything above that is obviously worse. Those who object to the label “climate alarmists” need to rein in their incredible Alarmist-In-Chief. It’s interesting that Mr Schmidt never criticizes the real culprits, he only wags his finger at the U.S. and the EU. An honest scientist would lay the blame where it belongs. News Item – Heads Up…. Welcome to Agenda 21. Europe has some new, really off the wall codes and Pres. Bush had agreed to “Harmonize” our US laws with that of the EU so I guess this is part of it. Look like “they” really want to push us back to unheated mud huts and then ban fires too….. I suspect you mean high humidity when you say the most GHGs. In which case it’s because there’s only a certain amount of energy available from dear Sol & Water takes some heating. This is why dry places are those that seem to show warming, humid places don’t need to cool much to maintain the same overall energy so average temps go up. Like most Americans with a knowledge of history, I DO NOT WANT foreign laws trumping — or even influencing — our U.S. Constitution. To the extent we have veered away from the original Constitution and Bill of Rights, we have lost, bit by bit, what made our nation great. Self-serving groups and individuals have learned to game the system, from gerrymandering elections, with the result that politicians choose their voters, rather than vice-versa, to elected officials actually working hand-in-glove with foreign governments to assist the flood of illegal foreign nationals coming here to, among other things, illegally vote our largess into their pockets. With every pig in the public trough vilifying his stand, including the media, the military-industrial complex, education, Rockefeller Republicans, and numerous other special interests, LBJ won the election — and the country endured another decade in the Viet Nam war. Moral: don’t vote the way you’re told; vote in your own best interest. And remember that character matters. Hey everybody , it’s International Bacon Day . Just so ya know . Finally! The answer to one of the most perplexing questions in science today: What to call field of endeavour or people who delve into the dark side of science and prognosticate on climate in the modern age? We finally have an answer!! Just think about it a moment. Don’t think of Nov 4th as election day, think of it as the great Pink Slip day. You know what they say about ‘paybacks’. Anthony, what do you make of this? “…The history of this IRS gag order is instructive. It began with the fraudulent election of Johnson to the Senate in 1948. It has been well established by both conservative and liberal historians that Lyndon Johnson’s election to the Senate in 1948 was won by massive voter fraud. Known as “Landslide Lyndon,” this mean-spirited political operative was “elected” by only 87 votes. His challenger, Coke Stevenson challenged his election and presented credible evidence that hundreds of votes for Johnson had been faked. Johnson, however, was successful in blocking Stevenson’s effort by the clever use of court injunctions. The gag order on churches effectively wiped out the US citizen’s homegrown “NGOs” in every town and allowed foreign run activists groups and lobbyists to occupy the political vacuum. In an April 1994 issue of the Wall Street Journal, a tiny back page article stated papers found in the Kremlin show activist groups in the USA were not only funded by but lead by the KGB. That quote I posted @2:30 pm was by Sen. Barry Goldwater. Mafia cash in on lucrative EU wind farm handouts. Edmund DeRothschild was also cited as working alongside Maurice Strong in 1972. Then Richard Milhous Nixon immediately trashed our trade status agreements with China and a few others. Trade agreements that had protected our businesses and jobs well for about 200 years. While Kissinger was teaching the Saudi how to charge more for oil. Gerald Ford didn’t change a thing. Jimmy Carter is partly the reason the conservatives were replaced by the liberal left in the democrat party. Then Ronald Reagan went about busting unions, as did Bush Sr. Their quail hunting buddy, Sam Walton was very effective at putting down any and all union organization in his company. Then along came that slippery little former Democrat that became a Republican United States Senator from Texas, Phil Gramm. The Gramm-Leach-Bliley Act got rid of the Glass-Steagel Act that had been put in place after the great depression to separate the banks from risky investment markets. Not only that, but when everyone was distracted by the Bush-Gore election deal with the hanging chads on ballots in Florida he slipped in legislation that made the whole credit default swaps and derivatives bomb. What is the control goal? Global governance and wilderness lands as collateral? You’re one person who is not uninformed and in denial. Hi Robert, can you inform us of your telescope specs so as to compare with official counters? Wolf used an 80mm refractor with 1100mm focal length, most likely a kellner eyepiece and a magnification of 64x. Locarno and Catania (SIDC) use a 150mm refractor, 2300mm focal length and unknown eyepiece. Why am I not surprised by this story about Sir Muir Russell and his fee for the enquiry? A former civil servant criticised for his role in the Holyrood Parliament building fiasco has pocketed £40,000 for chairing an inquiry into the recent climate change row. Sir Muir Russell walked away with nearly £6000 a month for leading a probe which cleared scientists at the University of East Anglia of data manipulation. Hacked e-mails written by university staff led to fears that information on climate change was being manipulated, a row that was played out internationally. The six-month probe concluded with Russell and his team noting the “rigour and honesty” of the scientists. A freedom of information request has revealed that the university paid Russell a £40,000 fee for his chairmanship. He also benefited from £2908 in travel and £976 for accommodation. The Review website notes that the team met on 15 occasions, which works out as the equivalent of Russell receiving £2666 per meeting. John Wilson, an SNP MSP in Central Scotland, said: “It is difficult to accept that Muir Russell should have received £40,000 for an inquiry conducted by East Anglia university. Orion 70mm Achromat F/10 (700mm FL), Meade Super Plossl 26mm. All surface fully coated, optics far superior to anything Wolf would have used, and that goes double for eyepieces. Modern Apochromats did not exist back then. Anyone who has or had used a 1960’s style refractor knows how far optics have come in the last 50 years. If I cannot project ghostly spots, Wolf certainly could not. It gets worse than that: I believe some are using adaptive optics to cancel out seeing conditions. One might as well start up a survey of who is using what, in the same manner of reporting issues that surfacestation.org has done. This is a big story I think, some are trying to cover up how good the new optics are. Check out this pic of Catania’s telescope, they do not mention the quality of the optics. I received my new gear today, a kellner lens and camera gear plus solar filter. Its designed to be like Wolf’s 40x pocket telescope which was fundamental in his method. I just barely made out 1015 which is not small. I wonder why don’t they start mass production of the stuff. If it is self replicating indeed, it should be cheap like dirt. Also, any advance in the biochemistry of these bugs is dependent on their large scale availability. I meant to say sunspot 1105. I think it is pretty obvious why the sunspot record has increased by at least 20 % since Wolf’s day. O/T? Not on an open thread. Here’s the great British/Canadian writer Mark Steyn on Labor Day. Well. That was 10/2006 and maybe needs to be updated. Anyone know if String has actually been useful in anyway? Remember: neither Time nor Space exist as actual entities…..and neither does anything in the singularity before the big bang. Wrong….Infinity existed…the infinity of energy, but something broke it’s infinity symmetry of nothing. Nothing is infinite BTW. Wasn’t the universe indicated to be eternally expanding recently??? Seems to me, that nullifies the Oscillating Universe theory that Hawking is surely appealing to here, because if it never ends, it never oscillates. Garrett Lisi’s E8 is so much prettier and M Theory is like Frankenstein on skis. Think i’m going to do what Watson-Crick did when cracking the double-helix, i’m going to guess that nature prefers the prettier theory. …..Regarding Time & Space in the Singularity….if time and space don’t exist as entities in and off themselves, then, We @ WUWT can pack an infinite amount of it in any kind of sized dot you want. And where does all the information come from to accompany all the matter being created at the Big Bang. Information can now be created but not destroyed apparently. Has anyone observed the so called ‘Information’ membrane at the entrance to black holes said to be in the temperature range of……………few billion degees i think it is?